*sigh* More starch. Hotdog bun + croquettes + corn. I know corn is considered a vegetable, but it's actually more starch than veggie. Living in Iowa, I love the stuff (a lot of us grow it in our gardens), but it really isn't the most healthy vegetable going. And no, ketchup doesn't counts as one of your 5 a day. Not only is there only a little bit of tomato in a serving of ketchup, but it also has a LOT of sugar in it. So this lunch was actually more like 2 proteins (hot dog and yoghurt), 3 starches, and no fruits or vegetables. Unless the hotdogs were made from lower fat chicken or turkey, I'd actually give this lunch about a 2 on the health rating. If low-fat hotdogs, I'd bump that up to a 3. Not sure I'm liking this new idea about only getting fruit if you eat the rest of your lunch first. I get the whole idea about food waste (not good), but what if you wanted a healthier lunch, so preferred to eat fruit instead of your croquettes or the hot dog roll? I think you should be provided the option to decline a starch and have a fruit instead. I guess the good news is that at least you're getting enough volume of food to fill you up now. Congratulations on your concert and solo! I'm sure you were brilliant! I know what kind of lunches I would have chosen as a 9-year old, and most of them probably wouldn't have included many vegetables. I'd have been loading up on starches, too. And I wouldn't have known that corn was actually a starch, not a vegetable, at that age. So it would be nice if the options given required the inclusion of a real vegetable and not just all starches. Veg's lunch yesterday was awfully starch-heavy without much in the way of fruits or vegetables, either. Look how much more sweetcorn and croquettes are on the plate before and now...something has changed! The menu is shocking. Even with the unlimited salad option. So much processed rubbish. Perhaps if you served better and tastier healthy meals they would get eaten. So this isn't a question of "nicer photograph[s]." 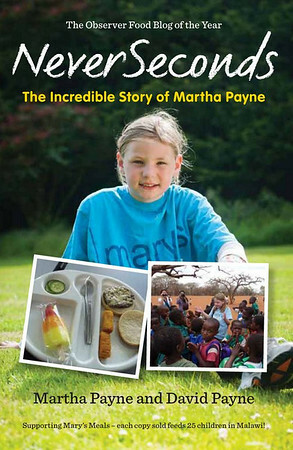 It's a question of feeding children nutritious meals instead of all of the highly processed junk and mostly nutritionally-empty starches Veg and her school-mates are currently being fed. When a 9-year old writes on a blog that she's worried about getting in trouble for asking for some fruit with her lunch, that concerns me. When she later writes that "the council" has announced that children are allowed "as much salad, fruit and bread as we want" and can "have fruit and a dessert, fruit if you have a starter and both salad and veg" that rather tells me that there's been at least a policy clarification, if not an actual change. And it again concerns me that she and her sister feel they need to bring an e-mail from the council to school to back them up. And then Veg reports that fruit is no longer available until/unless the rest of lunch has been eaten first. As I said, what if Veg preferred to actually get some nutritional value in her lunch by passing on some of the starch and having fruit instead. I would suggest you go back and look at the photos of the first meals Veg posted and tell me if you think that would have satisfied you and kept you from getting hungry in the afternoon when you were 9 years old. As previously stated, at least the portions seem to have gotten larger, suitable to grade-school children. But this school lunch program has a LONG way to go before they can claim they are actually adequately meeting the nutritional requirements of primary school aged children. It took me a long time to accept the brown bits of corn too. They are just as delicious! Congratulations on the clarinet solo! I would love to show you how our lunch looks like in Finnish high school but I just graduated TODAY (well, the celebration is on Saturday but today was the last day of school) so I won't be eating there anymore :( Which is sad because we had really good food! We always had some sort of salad (except on soup days, then we have freshly baked bread!) and you can have as much as you want. Then we have either pasta, rice or potatoes in some sort of form and then some sauce or sausages or something. Or soup. We also always have a vegetarian option. We don't have dessert but we can buy something sweet from our school's café. Our food is healthy, we can have as much as we want (except for the bread. And meatballs. And sausages. But I always eat one extra slice of bread. Or maybe two.) and the best part is: it's free! 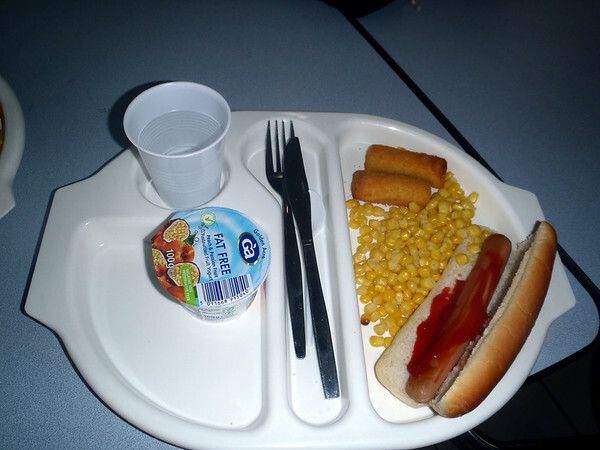 Our school food, in every school in Finland, is payed from tax money, like all of our education. So I consider myself very lucky. Keep up with the good job, you're making a difference here! In our school food is bad and we dont have freshly baked bread. I think that it is not okay for your school to make you finish all your "food" before getting your fruit. Fruit is just as important (if not more important) than many of the items on your tray. It should be allowed to help fill you up. I love hot dogs, but they aren't exactly full of nutrition. I wonder if there is a reason for this new rule? Perhaps your Dad needs to speak with the Council again? Good job on the solo! I would have been very nervous too. Ich arbeite in der Schulmensa und möchte auch einmal unser Essen zeigen. Die Kinder haben es sehr gerne gegessen! Ich finde deinen Blog sehr interessant und werde weiterhin beobachten, was ihr zu essen bekommt. I haven't been to school for many years, but when we were smaller we had no choices and got what we were given. I remember being scared of the dinner ladies in primary school because they were very strict and made us eat even if we didn't like it. When we were finished we had to take our trays and plates to the corner of the hall where there was a table with lots of different buckets. We had to scrape any food left into one bucket, pour liquids into another, stack the plates, cups and bowls and put the cutlery in another bucket of soapy water. Nothing was disposable and it all got washed. We were only 6 or 7 years old when we had to do this and nobody helped us. Sometimes if we really really couldn't bear to eat the food (which was often horrible, and quite similar to yours) we would try to sneak over to the buckets to scrape it away without being caught. Sometimes we were caught and we'd get in trouble! When I was in High School it was similar, until we were in Year 5 (GCSE year), then we had a choice of food. I love fruit and vegetables and healthy food, and I did then too, but the veggies were always overcooked mush and there wasn't really ever any fruit. So I used to eat what everybody else had, chips and gravy! It sounds disgusting and strange but we also used to ask for grated cheese on top. Eventually, we were told we weren't allowed to ask for cheese on top, but they were allowed to give us a small bowl of grated cheese each, so we asked for that and poured it onto the chips and gravy ourselves. Salads in both schools were always soggy and slightly brown iceberg lettuce and a bit of cucumber. Once another girl found something purple in her hot dog sausage. It looked like plastic to us but when she mentioned it the dinner lady told her sternly that it was spice. Thanks heavens my mum and dad gave us a great breakfast and a home cooked meal every night because all of that is a bit of a disaster isn't it? ... and it was like that for my entire school life! Carbs on top of carbs on top of carbs - hot dog bun, sweetcorn and croquettes. And the hot dog is loaded with nitrates. I have never seen a hot dog served with sweetcorn before! Never. It's crazy that you have to finish your food before getting fruit, we should encourage children to eat fruit not discourage just to avoid wastage! I would much rather my child eat less of a processed icky hotdog and save room for a piece of fruit! Your blog is brilliant though please keep it up! I just hope your school changes its crazy policies and a growing child does NOT need fat free yogurt!!! Veg, I love to read your blog. I'm so proud that you along with your family have taken a stand against unhealthy school lunches and that you're making notable changes. It just goes to show, that with the proper support system, change is possible. since reading you're blog, I've thought about having my son or daughter do the same in order to create positive changes at their school too. Thanks for the inspiration, and keep it up!! No changes to the menu perhaps but a huge change to the portion control, just compare the amount of sweetcorn given! And why have there been no changes to the menu? If you are having to come on here to defend that the poor quality food in these photos is Veg's choice, why is she given a choice of poor quality food in the first place? Except there seems to be ALOT more sweetcorn and an extra croquette. Still processed rubbish but at least she might have enouhg energy to last the day!!! I found your awesome blog until today via website of Finnish newspaper.. so they write about your blog here in Finland! I'm 24-year-old girl who study in vocational school such studies as hotel, restaurant and catering industry. Next spring I graduate as a chef, only if I don't manage to get in University of Helsinki this Autumn. Please continue writing Your GREAT blog! I'm sorry you have to eat this. I hope you get real food at home. Really makes me appriciate Finnish school lunch. Hi VEG, what a wonderful blog you have going here. I think it is very well done and a great idea. Many adults really don't know what kids are eating at lunch these days, sometimes it is less than healthy, but I wonder if adults are eating as well as kids do. Most adults drink a lot of coffee at work, rarely get time for a bit of exercise during the day, and if they don't pack a healthy lunch, it can be cheaper and easier to buy fast food from the shops. Here in York Region - Ontario, Canada, most of the kids bring their own lunches to school. Many schools have a litter-less lunch policy. That means no garbage left over. No matter what a parent packs in their child's lunch, it has to be in a re-usable container and it all goes back in a lunch bag and home to be washed every day. Most schools are also peanut free, so no one is allowed to use peanut butter or peanut products because of allergies in some students. Most lunches contain a sandwich, a drink, and then some snacks - fruit, vegetables, and sweets. Kids have a early morning snack break, then a lunch, then an afternoon snack. The go to school for 6-7 hours week days on average. At least when a parent makes your lunch (with your help) you tend to get things you like. This is very important since we have very diverse cultural heritage in Canada, and some people prefer their own ethnic foods. I will see if I can get a photo of my 6 year old nephew's lunch bag to show you one day, he certainly loves to eat. The school lunch you where given here is very poor. The company i work for do not allow us to use Hot-dogs as really they are snack food and full of processed rubbish. It seems that the person who do your Menu's have no imagination, i did serve hot dogs i would have some well cooked onions with the hot dog and oven cooked chips Plus a little mixed salad. I expect the reason why they are now only giving you fruit after you have had the meal is that they might say that if you have not finished your meal you cant have fruit. i would find this out if i was you. Are the meals you get cook on site (i.e. in a kitchen with in your school) or are they brought in from another unit. Also do you know the name of the company that provides your meals or are the people employed by your local Authority ? Any way we had Roast Pork at my school yesterday, here is a linq to my blog. Awesome blog, I'm definitely going to read this in future too! 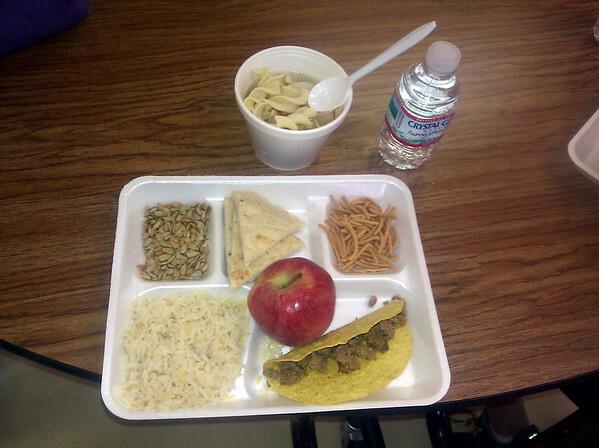 I'm fascinated by the idea of this blog, and would love to take a pic of my school lunch. Though since I'm already 21 yrs old and studying in University of Applied Sciences, you can't quite compare your lunch and mine (and I've been on summer holiday for a month already). But I hope that some other Finns will send you pics of their lunches! And of course people from all around the world, it is very nice to see how the food looks like in different places. I hope you will have an awesome summer! Hi Veg, I'm wondering how much protein there is in your hot dog. In fact, I'm wondering how much meat is in a hot dog sausage. My guess is not very much. Glad to hear that you play clarinet. My ten year old great-niece does too, at her school in London. It's finnish so you don't understand it but it basically explains the idea of your blog and tells about how popular it is now. I just wanted to say that keep up the good work! You write nicely and blog is easy and interesting to read. Now I'm really ashamed that I've ever complained about our lunch at school (when I was your age), because it really is good and FREE for us. I'm studying in a university now but maybe I could ask two of my nieces (they study in primary school) to take a picture and I could send it to you. Great blog, keep it going! I'm sorry you have to eat that something called food.. I've been following your blog with great interest. So much for 'Eating a rainbow'... All of your meals are very beige and not terribly generous, especially if you compare them to some of the school dinner photos from around the world. We had wonderful school dinners when I was a child, but I went home for my lunch four days a week, which was much nicer. Hi Veg! Great blog. I'm from Finland and we REALLY have good food! And you can get it so much if you want it. I can maybe send picture to you. Keep it up girl! I just saw your blog in the German TV ! I'm a Student from Germany and saw your Blog just a few minutes ago in a German Tv Show!Cool Idea and great Blog! okay. It looks okay ... We are in the school cafeteria is no, but certainly soon. I hope there are more such pictures. A few minutes ago I've seen a report of your schoolsfood blog and I'm angry about the cooks and your headmaster that they allow something horrible! OK I came to comment on the new rule about not getting extra fruit until you finish the rest of your food, and I see these comments from ab origine... VEG please, who is this person? Is this someone who works in your school? Is it a parent of a student or students at your school? Is it one of your classmates? I have been reading your blog for a while now, and I also salute you. How cool is it that you've been written up in a newspaper in Finland?! You totally rock! Incidentally, I live in North Carolina (not too far from Georgia! ), USA, and I work in a public school system. One of these days I'll have to send you a picture of what our students eat. Just a short comment from Finland: You probably didn't know that the students here don't have to pay for their meals at school. Here's a list of last week's meals at elementary schools (grades 1-6) in Lahti, Finland. I hope I have translated the list understandably. I'm from germany and already out of school but all of the pics u took REALLY shocked me. There is so little food on your tray and the fact that you and you're sister are/were afraid to ask for more.. I think that you do a really good job on blogging about that. keep going, you could change a lot! I'm from Brazil, and I'm very bad in english, I'm sorry. You're a good example for all people of the world! Kisses for you, big revolutionist. I kinda got the impression it was a disgruntled "lunch lady." I find it incredibly sad that someone like that feels they have to come here and even attempt to justify feeding this mostly nutritionally empty stuff to school kids. Jaylah, I think they are trying to say that the food has not changed it's the same menu. 2. why havent they changed? they are awful! I can't believe that you only get fruit if you finish your meal. Fair enough if it was sweeties they gave you but fruit is so good for you and they should not be using it as a reward. Not going to lie, kosher food is very good, and I find it appalling about the 'no fruit until you finish' rule - I'd much rather have to eat a piece of fruit than a stodgy main course! Brilliant blog - glad the ban was overturned. is this food? This miserable hot dog and corn? This is disgusting ... I'm Polish and I've never seen such filth :/ Well, that reacts to this nasty food, after all, is unhealthy! To give fruit AFTER meal is very bad for one´s health. Fruit can be eaten BEFORE meals only. "Natural Hygienists have known for a long time that fruit doesn’t combine well with other foods. The reason is that fruit contains simple sugars that require no digestion. Thus, they will not stay for a long time in the stomach. Other foods, such as foods rich in fat, protein and starch, will stay in the stomach for a longer period of time because they require more digestion. So if you eat fruit after a meal, the fruit sugar will stay for too long in the stomach and ferment. This is why people experience digestive trouble when eating fruit that way. They then blame that particular fruit for their trouble and claim that they are “allergic” to it." Hi, I think your blog is a great idea and very interesting and educational for me as I went to school in Germany and we used to finish school at 1.05pm and went home for lunch. I'm not sure why you rated this meal 8/10 for health though - it seems quite a lot less healthy that the gammon meal which you rated 6/10 - how do you decide on the ratings? Processed meats and white bread are not very healthy I think, and neither are ketchup and deep-fried croquettes. Sweetcorn is a vegetable but rather high in sugar, not very healthy for a veg. I wonder why they serve you fat free yoghurt? White flour cake with icing (that is probably made of hydrogenated vegetable oil) is ok but yoghurt with some real milk fat in it is not ok? If yoghurt is fat free it means they have to put more sugar in it to give it any taste.